Times Square tourists will be able to take a digital dive deep into the heart of the sea without even getting damp when the new National Geographic Encounter: Ocean Odyssey attraction opens this October in New York City. Opening October 2017 in the heart of New York City’s Times Square, National Geographic Encounter: Ocean Odyssey will be a first-in-kind immersive entertainment experience that could be described as a ‘virtual aquarium,’ simulating experiences similar to some found at marine parks like SeaWorld, but without actual animals. Instead, National Geographic Encounter combines natural-looking sculpted undersea environments (including kelp forests and bioluminescent coral reefs) with digital technology that enables visitors to explore the depths of the Pacific Ocean and get close to its creatures. In the 60,000 square-foot venue, the use of technologies such as video mapping, 8K photo real animation, mega projection screens, immersive sound and interactive “real-time” audience tracking will allow guests to virtually interact with sea lions, play with rays and dolphins, come face-to-face with humpback whales, Humboldt squids and great white sharks, all culminating in a 40-foot dome finale. After guests go on their journey through the Pacific, they “resurface” from under the ocean and enter the second portion of the experience where they can further engage, share, and have fun as they learn more about what they just encountered. This area features a broad array of interactive technology, including holograms, touch-screens, photo moments and more, and also highlights important themes around ocean conservation and scientific research. National Geographic Encounter is produced, developed, and managed by the creative minds of SPE Partners, under license from National Geographic. SPE Partners has engaged a creative team that includes Falcon’s Creative Group, Pixomondo, Mirada Studios, and composer David Kahne. 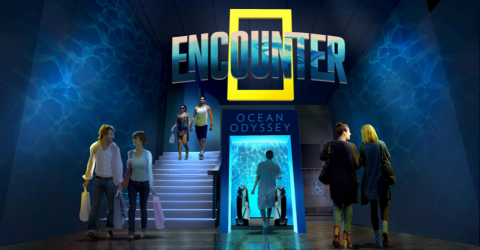 National Geographic Encounter: Ocean Odyssey is a timed ticketed walk-through experience that lasts approximately 90 minutes, plus a retail experience. In addition, a separate state-of-the-art private event space will feature multiple rooms and the ability to accommodate events of up to 1,000 people. All events will be managed by The Shubert Organization.